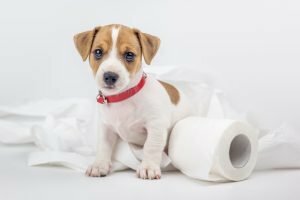 Why Do Puppies Eat Poop?!? You are at a complete loss for words. Your pretty little pup took a poop and then took a bite! GASP! We know, it can be a jarring sight, but we are actually aware of this behavior, which is pretty common in dogs! The medical term for when a dog eats poop is called coprophagia and the definition is “the ingestion of feces by an animal.” There are some who eat their own stool and there are some who eat others. It’s not the most favorable trait to discuss that your pet has, but it’s not as unsafe as you may think. Since your pup is domesticated (and this goes for cats too), they’re likely on a healthy diet, which means their fresh stool is healthy. Don’t shoot the messenger! These are well-documented facts. On the flip-side, dogs who are unvaccinated are at risk of being sick if they consume stool. Dogs have long since been scavengers. They survived from the waste and scraps of people living on the edge of civilization. Historically, the mother dog would clean her newborn pups and consume the waste when licking their genital areas. The mother dog would transfer the waste and the pup learned to like the taste. Ideally, your dog shouldn’t be eating his or any other animal’s poop. As we mentioned above, healthy dogs will be okay, but if your pup becomes ill, that becomes problematic. It’s more so if they consume the poop of another sick dog, and so on. Pay attention to your dog’s poop to do make sure he doesn’t have diarrhea. If there’s presence, a stool sample may be necessary for your veterinarian. We know this is a crappy conversation to have, but you should also know that dogs who eat the stool of other animals can be trained to not do so. They should be monitored at all times and if possible be confined to a fenced property where you know the scoop on the poop! If your dog eats poop of other animals, the best way to train your dog is through the “leave it” command. This is a relatively easy command to teach your pup. Once it’s learned you’ll see improvements.